Back in August, Xiaomi adopted an interesting approach to the Indian market, launching its first locally-assembled smartphone, the Redmi 2 Prime. Earlier today, the company announced a follow-up the device, the Xiaomi Redmi Note Prime. Although many Xiaomi fans were expecting to see more upgrades compared to the Xiaomi Redmi Note 4G, a handset that the company launched back in the summer of 2014, the Redmi Note Prime is basically the same device but with a very slight boost in specs. On the other hand, given that Xiaomi's first made-in-India smartphone, the Redmi 2 Prime, also represented only a slight upgrade compared to the regular version of the Xiaomi Redmi 2, these similarities shouldn't come as a shocking surprise. Compared to the Redmi 2 Prime, the Xiaomi Note Prime comes with a larger display and updated cameras. The Redmi Note Prime is priced at INR 8,499 (around $125), while the Redmi 2 Prime was launched at $109, but to those who favor the phablet form factor, the upgrades will be worth the $16 price difference. 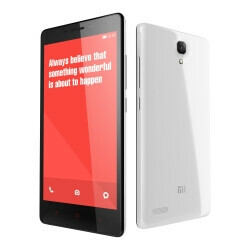 The Xiaomi Redmi Note Prime comes with a 5.5-inch IPS display running a resolution of 720 by 1280 price tag. These specs result in a PPI of 267, which is well below that of modern flagships, but acceptable given that we're looking at a budget device. Under the hood, the processing power is drawn from a Qualcomm Snapdragon 410 chipset - 1.2GHz quad-core CPU, Adreno 304 GPU - paired with 2GB of RAM. In the storage department, the Xiaomi Redmi Note Prime comes with 16GB of onboard storage, expandable by up to 32GB more via microSD. Other specs include a 13MP primary camera, a 5MP selfie shooter on the front, a 3100mAh battery, 4G support, as well as dual-SIM capabilities. On the software side, the Xiaomi Redmi Note Prime runs MIUI 7, which is a custom Android 4.4 KitKat-based implementation of the OS. The Xiaomi Redmi Note Prime launches tomorrow, December 15th, as an Amazon exclusive in India. If you're interested in importing a handset in other countries, you'll be able to get one from Mi.com. Basically, Xiaomi has run out of ideas. There's only so much the company can do now. Other well-known brands have already adopted the same strategy with their offerings, using the same processors and price-points, which are giving Xiaomi a run for the money lately. And it shows, because ever since Xiaomi decided to go mid-range and above with their newer offerings, and didn't put as much energy on the low-end of the spectrum by giving us rubbish, like these different versions of the same old hardware, it has lost many customers along the way. Consumers who have the ability to pay more wouldn't even consider Xiaomi as a primary choice, and would rather opt for other established brands. Xiaomi's bread-and-butter comes from the low-end range, but ever since they neglected this segment with no quality offerings lately, its sales has also been hit hard. So its not surprising despite it already being December, the company has not even hit 3/4 of their targeted sales numbers for the year 2015. Goes to show less consumers are buying Xiaomi these days. In other words, the company has peaked. Kinda outdated product Much better alternatives like yureka, Lenovok3 note, coolpad note 3 are there. They didn't launched redmi note 2 and note 3 in India. It's quite understandable because of the patent issues with Ericsson. But they even didn't launched mi4C instead they launched much weaker mi4i. Also didn't launched hybrid headphones, Mi pad 2, latest Mi band, etc etc... It seems like they don't really care for indian market. Glad other manufactures are entering indian market like LeTV.